Today, you are a member of... Zombie Road - You Are A Member! You may find yourself on Zombie Road this week members – tethered to a job beneath your stature as creative and brilliant genius. 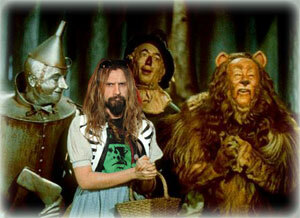 In the darkest of moments you can turn to the patron saint of irrelevant jobs: Rob Zombie. Back in 1984 while still sporting the surname Cummings, Zombie found himself a world away from his dreams of bump and grind monster rock: he worked as a production assistant on Pee Wee’s Playhouse. And yet: all that kids show kontent didn’t deter this son of a carnival worker from inventing White Zombie, the satan ‘n b-movie mayhem rock band, creating a ideal place from which to belt his raspy, hellbilly truth. And in a way, it all makes perfect sense though at the time it probably felt freakishly ridiculous. Keep your eyes on the prize this week, members. You may find that Zombie Road is indeed the Road to Oz.